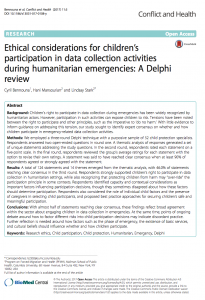 A Delphi review by Cyril Bennouna, Hani Mansourian, and CPC director Lindsay Stark, sought to identify expert consensus on whether and how children participate in emergency-related data collection activities. With almost half of statements reaching clear consensus, these findings reflect broad agreement within the sector about engaging children in data collection in emergencies. At the same time, points of ongoing debate around how to factor different risks into child participation decisions may indicate discordant practice. Further reflection is needed around how factors such as the phase of emergency, the existence of basic services, and cultural beliefs should influence whether and how children participate.